The Art Car Museum is aptly named; it is a museum that houses Art Cars. It is a not-for-profit arts organization. They house many art car exhibits and regularly hold events. The Museum is located in Houston. It is open Wednesday through Sunday from 11:00 a.m. to 6:00 p.m. The Museum is closed on Monday and Tuesday. The Art Car Museum, colloquially called the “Garage Mahal,” was opened in February of 1998. Ann and James Harithas opened the museum. Ann Harithas is an artist and supporter of the Art Car movement. James Harithas is the Director of the Station Museum of Contemporary Art in Houston. The Harithas’ opened the museum to showcase local art cars to draw attention to an artistic medium that is often overlooked by more traditional museums. 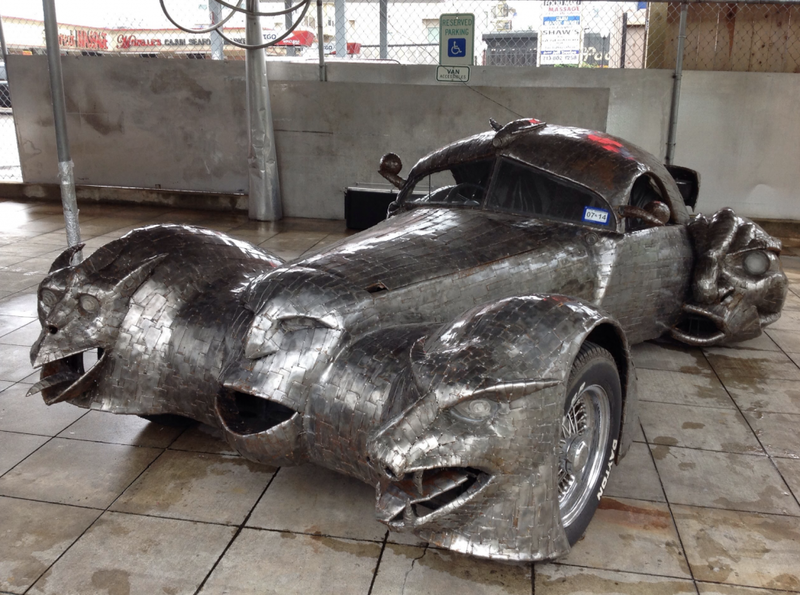 Houston is considered by many to be the art car capital and houses more art cars than any other city. The Museum showcases this fact with its collection of “imaginative, elaborate and artfully constructed art cars, low riders and mobile contraptions.” The art cars housed at the museum are boasted as providing a reprieve from the traditional conventions of the modern art world. They are not created for the marketplace, but merely for the joy of the art. However, the museum does not limit itself to only housing art cars. It also showcases rotating exhibits from artists of all media. The rotating exhibits showcase work from local artists all the way up to internationally recognized artists. In addition to these regularly shifting exhibits, the Art Car Museum hosts an annual open call show to allow the local artistic community the opportunity to present their work; this year’s open call show’s theme is animals. Along with that, the Art Car Museum Hosts events periodically to showcase various works or provide workshops for children to learn more about art.